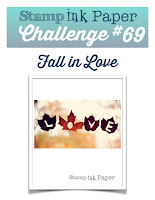 Tina's Crop Shop: SIP Challenge #69 - Love! Hello and Happy Tuesday! Today over at Stamp, Ink, Paper we have a Love theme! As usual, there is lots of awesome inspiration for you to check out! Since the challenge badge is Fall in Love, I first decided to go with some fall colors. I started with Bristol Watercolor Paper as a base for a watercolor wash. I used Aqua Painters and the inks used were Pumpkin Pie, Pear Pizzazz, and Daffodil Delight. Once the background wash was dry I used my Stampin' Up Archival Black Ink to stamp my sentiment and then I heat embossed it with clear embossing powder. Next the sentiment was cut out, as well as a piece of Pumpkin Pie Cardstock, with My Favorite Things Stitched Rounded Rectangle Dies. From the extra watercolor wash, I cut out some leaves with the Gina Marie Oak Leaves Dies.. no need to waste a good watercolor wash, right?? The Pear Pizzazz cardstock measured 5 1/2" x 8 1/2" and was scored at 4 1/4". The next layer was a piece of 5 1/4" x 4" Daffodil Delight background paper that had a piece of green seam binding attached and knotted on the left side. 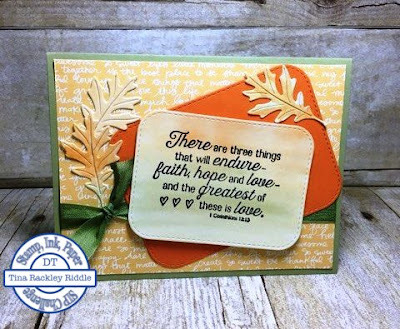 Fast fuse was used to attach the Pumpkin Pie stitched layer and dimensionals were used to attach the sentiment layer. The Gina Marie Oak Leaves with adhered with Fast Fuse.